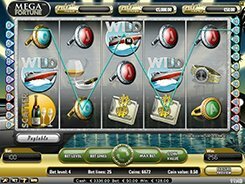 Hot City is a 5-reel 25-payline slot themed around living a glamorous life in a big city. Capturing the luxury lifestyle of a city socialite, the symbol set includes smartphones, cars, rings, gorgeous handbags and other theme-related icons. 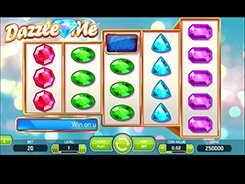 Before a spin you can customize a coin value ($0.01 to $0.5) and the number of coins per line (1 to 4), thus the minimum and maximum bets are $0.01 and $50 respectively. 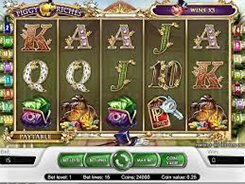 The slot features a wild, a scatter, free spins, a bonus game and the top jackpot of $20,000 coins. A wild symbol substitutes for other normal symbols and pays out the said jackpot if five appear on an enabled payline. A scatter (Just-Married Car) awards up to $12,500 for five of them occurred in any place on the reels. 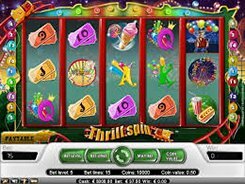 Besides, three or more scatters trigger 10, 20 or 30 free spins with all wins tripled. There is a second-screen bonus feature unlocked by three Gift Box bonus symbols. In the bonus feature you are invited to pick from an array of designer shoes, each awarding a random cash amount. The feature continues until you find an empty box.